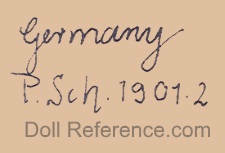 Peter Scherf founded his doll factory in the "Town of Toys" Sonneberg, Germany in 1879, when Peter passed away in 1887 the company was divided amongst family members, who continued to provide bisque dolls, many for the American market, well into the 1920s. The antique bisque Dolly faced doll heads, were produced for Scherf by Armand Marseille's porcelain factory. The antique bisque doll shoulder heads came on a riveted kid leather body with bisque lower arms and hands or bisque doll socket heads were on a jointed all composition body, wigged, glass eyes, open mouth. 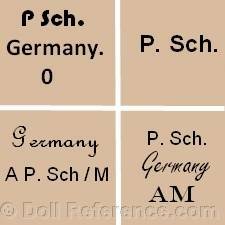 Dolls are usually marked: Made in Germany P Sch or Germany P.Sch. + a mold number and are of good quality. Doll shown on left; Peter Scherf, antique bisque Dolly face socket head with Armand Marseille (A.M.) and Scherf markings (Made in Germany P.Sch. ), sleep eyes, feathered brows, open mouth on an all composition jointed body with stick legs. Note: This is a Dollar doll made for the American market, as denoted by her elongated cylindrical upper leg thighs, a doll maker could add to the dolls height, without incurring higher costs and still sell her for $1.00, we call this a bigger bang for your buck.